Last time, we discussed the various types of fractures and the importance of “reducing” a deformity in a limb caused by a broken bone. Your goal is to take a bone that is poorly aligned and position it so that the broken ends are together again as before the injury. 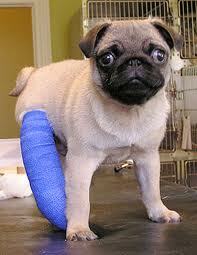 Fractures heal more quickly when there is alignment and compression of fragments. Without this procedure, the bone will still attempt to knit together but will lose the strength necessary to support the body, especially in a lower limb. Needless to say, it will much more likely to re-fracture when under strain. Orthopedic surgeons often perform this procedure, placing metal pins and screws after opening up the leg surgically (an “open” reduction). In circumstances where modern medical care is unavailable, this will not be possible, so you will perform what is called a “closed” reduction. Without anesthesia, this will be a painful process. Also, there are risks to this procedure and nerves and blood vessels can be damaged, so extreme caution must be taken. Despite these concerns, you may have no choice if you are hoping to restore normal function to the extremity. Reducing a deformity is best performed with 2 persons. One supports and provides traction on the side closest to the torso, and the other exerts steady traction on the area beyond the fracture. 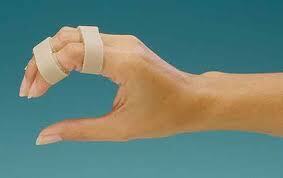 Splint or cast the extremity immediately after performing the reduction. 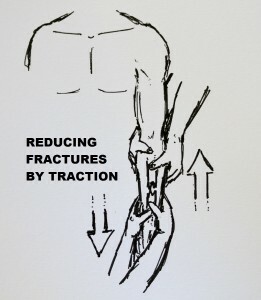 Sometimes, a method of keeping traction on the limb will be necessary to keep the broken ends of the bone in position. 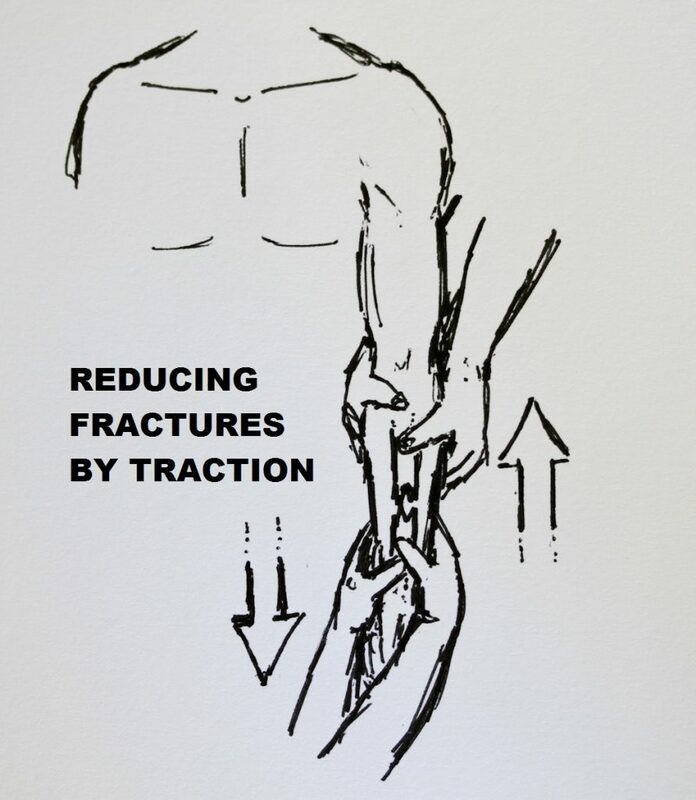 In an open fracture, thorough washing of the wound is absolutely necessary to prevent internal infection. Infection will invariably occur in a dirty wound, even if the reduction is successful. 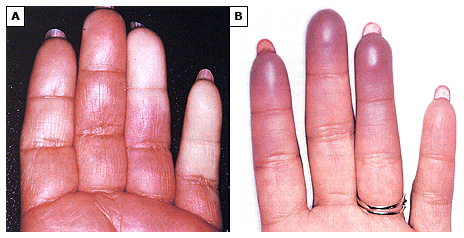 Antibiotics are important to prevent infections in the bone (known as “osteomyelitis”) in this scenario. Always check for pulses after the reduction is performed, to assure adequate circulation beyond the level of the injury. 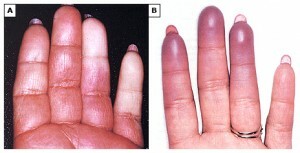 White or blue tips of fingers or toes will be a clue that the blood supply has been compromised. Also, touch the area beyond the fracture lightly with a safety pin, to determine that normal sensation exists and that no nerve damage has occurred. 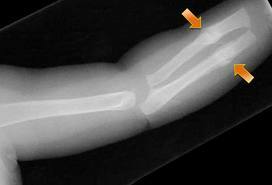 The cornerstone of fracture management is an adequate splint. It is very important to immobilize the fractured bone in such a fashion that it is allowed to heal. When you are responsible for the complete healing of the broken bone, remember that the splint should immobilize it in a position that it normally would assume in routine function. For legs: The leg should be straight, with a slight bend at the knee. For arms: The elbow should be flexed at a 90 degree angle to the upper arm. For ankles: The ankle should be at a 90 degree angle to the leg. For wrist: The wrist should be straight or slightly extended upward. For fingers: The fingers should be slightly flexed, as if holding a glass of water. 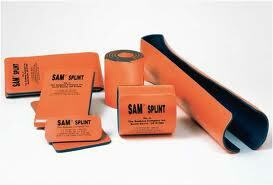 Splints can be commercially produced (SAM splints), or may be improvised, using straight sticks and bandannas or T-shirt strips to immobilize the area. Another option, as mentioned in our last article, is to fold a pillow around the injury and duct tape it in place. In any case, your goal is to immobilize the fracture in a position of function. Use as much padding under the splint as possible to keep the injured area stable. If you have the materials available, you might consider a “cast” for immobilization. 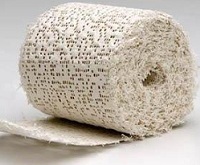 Casts are made of plaster wrap (see image below) or fiberglass, and can be improvised or found in commercially produced kits. While fiberglass casts are newer, many cast are still made from plaster. Plaster is useful because you can better mold the cast to match the particular injury. Unfortunately, plaster is heavy and must remain dry while in place. Fiberglass is lighter, more durable, and requires less maintenance. Both types are wrapped over layers of cotton to protect the skin from irritation. Your duty as medic is keep this material as dry and clean as possible. Newer materials are being developed to make your job easier, and some are waterproof. If the cast covers a portion of the foot, a cast “heel” will help maintain the integrity of the structure. Most fractures require 6-8 weeks to form a “callus” (see image below); this is newly formed tissue that will reunite the broken ends of the bone. Larger bones or more complicated injuries take longer. If not well-realigned, the function of the affected extremity will be permanently compromised. Fingers and toes may be splinted by taping them to an adjoining digit. This is called the “buddy method” (see image below). There are small manufactured splints that will also do the job. Neck injuries may be particularly serious, and an investment should be made in purchasing a good neck “collar”. Rib fractures are commonly treated by firmly taping the affected area, as it is the motion of breathing that causes the pain associated with the injury. In the future, we’ll post articles about individual injuries and how best to evaluate, treat, cast or splint, apply traction, and speed your patient to a full recovery. Are you prepared to deal with medical issues if the SHTF? With the Doom and Bloom(tm) Survival Medicine Handbook, you will be!